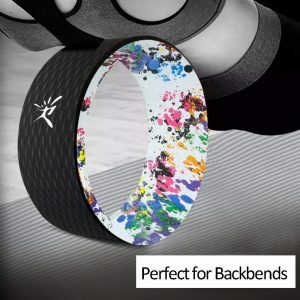 Yoga wheels continue to grow in popularity and they are the must-have accessory for any yogi who wants to improve on backbends and flexibility. The Risefit Yoga Wheel is an attractive piece of equipment that is available in a number of different color pairs. The surface is soft and durable, making it comfortable to use during workouts. Anyone who might worry about it holding its shape will like the fact that it can support up to 1000 lbs. Most consumers are concerned when they buy a product as to whether it will stand the test of time. This especially holds true when it’s something that will be used frequently. This wheel will definitely ease anyone’s concerns. It provides outstanding support as well as holding its shape even with repeated use. Conveniently lightweight at just under 3 ½ lbs makes the wheel easy to take along to the gym or studio. Just throw it in the care and go. It’s manufactured only using eco-friendly TPE foam with a strong ABS inner tube. The wheel was originally intended to be used to increase body strength and flexibility but its uses go way beyond that. If you work at a desk with little physical movement throughout the day, you may find yourself at some point experiencing stress and tension in your back and neck. You can eliminate that when you incorporate the use of the wheel into your workout. It’s also good for pain relief, opening up the back/shoulder areas, aligning the spine, helps tremendously with backbends and other challenging poses, etc. Keeping a wheel for at home workouts is a great convenience for those who don’t necessarily want to join a yoga studio or find that there are days that they aren’t in the mood to venture out. Also included is a manual of suggested poses for use with the wheel. This is something that is helpful for anyone who has never used this type of device. 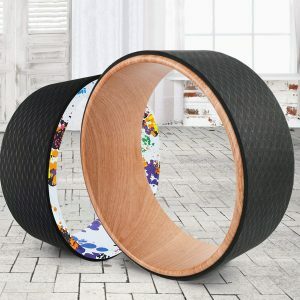 Whether you are looking for an accessory to make your workouts more productive or want to give a gift to someone who loves yoga, you will be extremely pleased with this wheel. Lastly, the wheel comes with a 3-year warranty. If for some reason you were to have a problem you have nothing to worry about. You have plenty of time to get a replacement or refund.